Of course you're right, but the pictures are doing a bit of translation . In fact you will need to replace the brushes and revise the collector on a turning machine. The Brushes are worn down completely after 50k km. Piccie here. Triumph (or Denso) won't sell replacement brushes, just the whole starter motor for over $700. A case of gouge the customer. Thanks D6864, I did turn the commutator down on the lathe and tried to source other brushes, unfortunately I could only find pure carbon, not copper/carbon material like the original. So l'll try the website you mentioned and see if they have something better. Used to be able to buy brushes by the bucket load, but these days the OEMs lock them up so we are forced to buy the whole motor. Having now purchased a replacement starter motor from Triumph for too much money I believe there is probably a design or manufacturing defect in the original Denso starter motors, P/N 428000-5540, which have now been upgraded to -5542. 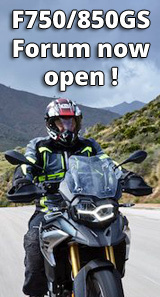 I suspect it was in at least the Tiger 800XC 2011-2012 models, based on the forum reports. Common failure symptoms in almost all cases include slow or insufficient cranking power when the engine becomes hot, say when idling in hot weather. Acts as if it is a weak battery but it is not, it is a failing starter motor. Once the engine and thus the starter motor cool, it will start again. This problem occurs more frequently until the motor finally fails at around 50K km. Also, on another unrelated issue, the grounding of the starter motor is minimal, depending on two small areas under the mounting tangs contacting the engine block, and prone to corrosion. I modified the connection when I replaced the motor. I am interested in this because i have 2011 Roadie 58 k on the clock, no problems so far. Good work, Tikru, you have found the correct replacement parts. I have looked at the website pictures and they are the same as those removed from my starter motor, so I am sure they are the right ones. I think I might have this problem as well. My bike is 2011 with 43K kms on it. It won't start while hot, but does after cooling a bit. However, the starter motor turns quite normally; the engine doesn't 'catch' is all. Is this what others are seeing as well, or would the starter not turn at all if the brushes were worn out? I had just had my 40K service/valve adjustment before this started happening and the software was updated. Could this be the cause? I had the battery tested, and was told it is fine. If the engine won't engage, probably the starter motor is not spinning fast enough. But if it is ok when cooled down, then sounds like it could be the same problem. My test was to get it hot until it faults, then quickly hose it with cold water until cool and try to start again. There was a recent case on Brazilian forum with a ST3, same problem of starter motor fail. As we know, Triumph deny warranty. So, a mechanic discovered that the brushes of Suzuki Burgman works on the starter motor of ST3. He fix it for $10,00. The question is, the starter motor of ST3 is equal to the Tiger?